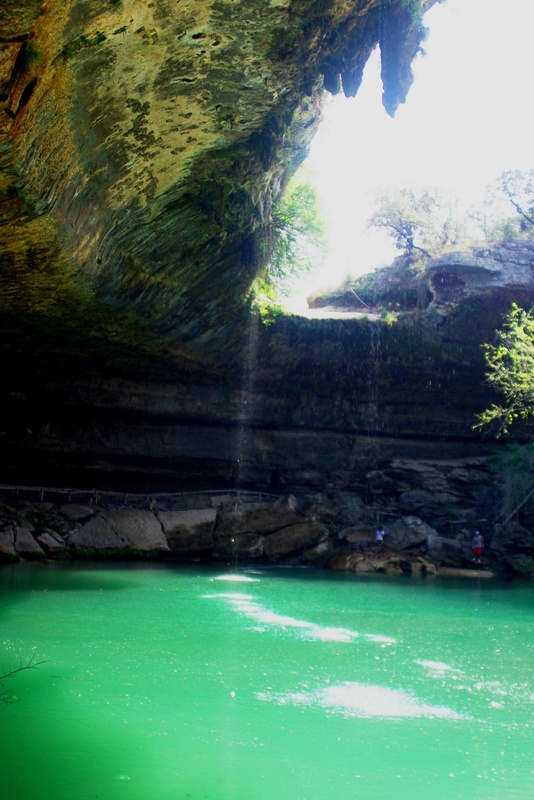 Austin's Hamilton Pool is one of my favorite summer spots. It was never in my plans to leave Sydney quite so soon, but family calls, so it’s time to say goodbye to the sunburned continent for now. I will miss the “no-worries-mate” blue skies, the sparkling harbor, the miracle economy and, most of all, the friends who have served as family during my time here. I am headed for another city of intrigue, however: Austin, Texas. My home for four years as an undergrad at the University of Texas, Austin is familiar territory. My sister has lived there for nearly two decades and I have spent a lot of time there on visits. The self-proclaimed Live Music Capital of the World is a hodgepodge of cowboy culture and hipster cool. The scorching summers are made bearable by two lakes and a generous sprinkling of icy, spring-fed pools. Throw in the fact that it’s a major high-tech center and the state capital at a time when another conservative governor is running for president, and it should be a very interesting place to be right now. I look forward to the adventure. I have launched into Australia’s sci-tech world with several pieces I have written for Popular Science Australia. The magazine incorporates some articles from the respected American version of the publication and mixes them with original content from here. It’s an exciting venue to write for now because the magazine is still fairly new to this country. I’ve done a feature on the new web criminals, as well as a couple of profiles of notable university researchers. More of those are to come, as Popular Science Australia is publishing a whole series on the subject. You can check them out under the Articles section. After nearly five years of planning, my husband and I have settled as permanent residents in Sydney Australia. We were drawn by the friendly people, the adventure of a new continent and winters where you never need snow boots. 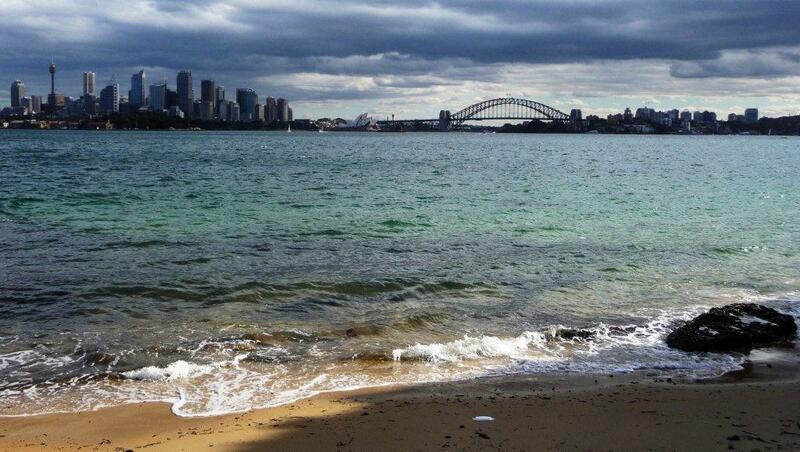 We’re also loving Australia’s green streak. I’ve just finished my first writing assignment, which ran in a local Chinese-language newspaper called the Australian New Express Daily. It was a package of stories about climate change and ways the average person in New South Wales could reduce their carbon footprint. I visited a woman had who created a points-based game to help get her family involved in saving electricity and hot water. The family also has a rain water tank, a solar water heater and chickens to eat vegetable scraps and fertilize the garden. You can check out the English version of the story, Climate change: the heat is on, in the Articles section of this website. I’m in Colorado, where I spent three weeks this summer while my husband, Michael, helped my father with home renovations. Michael and I took a break in August to wander the lesser traveled roads of southern Colorado, parts of which are literally designated a Scenic Byway (Highway 12). 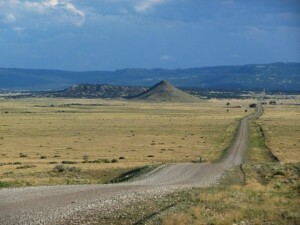 But perhaps our greatest discovery was in northern New Mexico, at a bison ranch called Spahn & Friends. I had never even seen a buffalo, all jokes about my Kansas upbringing aside. The brochure promised an exotic twist on the usual City Slicker experience, with a chance to tour the farm, sleep in the ranch house, eat buffalo meat and help feed the animals in the morning. To get there we traveled through ghost towns, asking directions from out-of-gas bikers on gravel strips so remote they didn’t even register as roads on our GPS. They snaked over volcanic flats where equine jack-rabbits, twice the size of our suburban bunnies, glided above the dusty grass. A herd of elk sprang up on one side of the road, then two coyotes on the other, followed soon thereafter by a waddling ground hog whose timing seemed to indicate a belief that the gettin’ was good. The ground eventually rose, our ears popped, and as the sun set, we arrived at our destination. 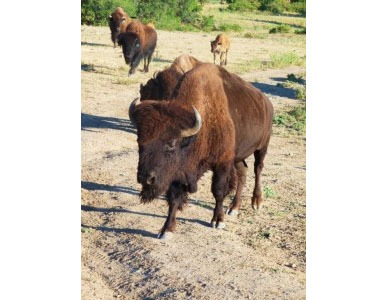 The Spahn & Friends Bison Ranch sprawls over 1,130 acres of land on Trinchera Pass, New Mexico. At 6,000 feet elevation, the air is thin and crisp. We passed pens of bison being readied for slaughter before coming to the 3,500 square foot log home where we would stay the night. Sonja cooked us a meal of buffalo burgers that evening prepared the German way – with egg, bread crumbs, onions and herbs. While the burgers sizzled, we wandered the ranch house and chose our lodgings. Since we were the only visitors, we had our pick of the three basic but comfortable guest rooms. After we settled in, Christian, a grizzled Bavarian who tipped his stein readily and appeared to have been raised on wurst and strudel, nonetheless explained that buffalo meat is lower in cholesterol, calories and fat than beef, chicken or even salmon. 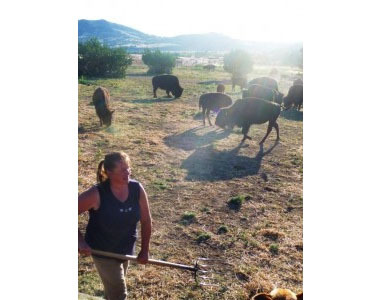 His bison were grass-fed and received no hormones. It was nice to find then when dinner was served, that the burgers were juicy and tender. The meat looked like beef, but wasn’t as fatty. I wouldn’t call it hangover food, but it was better than any turkey burger. As we ate, Christian regaled us with rants about the US Department of Agriculture and how they were becoming as bad as the German authorities. For years, the Spahn method of slaughter has been to sneak up on the animals in their pen and quietly shoot one or two of them in the head. It’s one of the most humane methods of killing the animals because they’re dead before they know what’s hit them. Because the bison are not stressed before their death, the meat is tastier too. But according to Christian, the USDA now wants him to bring the animals in bulk to a slaughter house. He complains the mass transfer stresses the beasts, and they die in fear, tense and miserable. The meat is tougher as a result. We were psyched to see the buffalo alive and on the range, so we turned in early that night. Inge arrived at 7 the next morning and introduced us to the farm’s canine ranch hands, Dixie and Xena. They rode with us in the back of a flat-bed truck, which was loaded with bales of hay and buckets of mineral pellets. There are two herds at the ranch, each presided over by a bull. The first herd we visited was considered meaner and more skittish. Michael and I had to keep quiet and stay at the back of the truck for fear of spooking them into aggressive action. These are not doe-eyed Bessies. Look at them wrong and they’ll come after you with the vengeance of a two-ton species that was almost wiped out. Inge lowered some of the mineral pellets onto the ground for them, then drove around the pasture and distributed hay in several batches, so that the most dominant cows wouldn’t hog it all. As the bison realized what was happening, they came running from the East, their thundering hoofs throwing up clouds of dirt in the morning sun. The bull, Fritz, was easily noticeable for his large triangular head. Several caramel colored calves mingled among the herd. We watched in silence for a few minutes, then drove on to the second herd. This group was friendlier, so we could relax and talk a while. Inge had names for some of them – Blackie and Tiny. Others were simply numbers: 48, 37. One heifer had had twins, an event so unusual that the cow won’t realize it’s happened and will leave the second calf to die. Inge had bottle-fed it until it was big enough to join the herd. I asked if she had trouble eating the buffalo after she’d grown close to them. “Nah,” she said. “I respect them, but they are being raised for food.” A visiting friend had once been horrified when, while eating a bison burger, Inge told her she was eating Monica. The friend exclaimed, “I don’t eat anything with a name.” Inge sneered at that idea, detecting a meat-eater’s hypocrisy. Although I secretly sympathized with the friend, I admired Inge’s integrity. If people are going to eat meat, they ought to be able to realize it is an animal, capable of having an identity. If they can still eat it in good conscience, fine. If not, they shouldn’t eat meat at all. So is Dixie, the cheekier of the two dogs on the truck. She had edged toward the side of the flat bed during our chat and the buffalo kept coming over to check her out. I thought they were nuzzling her, but eventually the bull, Franz, sidled up and it was clear there was nothing friendly in his intentions. Growls, grunts and German words were exchanged, and Dixie was commanded to the back of the flat bed with the rest of us. Apparently she’d been trying to establish her command as the queen of the vehicle but the buffalos are no one’s biatch. Even Inge, who they trust the most, keeps a healthy distance and will not get off the truck if the bull is around. And what is it all for? It can’t be the money. A check of 2008 sales figures from the National Bison Association shows bulls selling for only around $1,200 – $1,300. The labor costs alone have to be a more than that. As with most farmers, it must be a love of the land and outdoors that drives these people. As we arrived back at the ranch house, the dogs flew at the front porch, barking in rage. Inge jumped after them, grabbing their collars, and only then did we see what was going on. Christian had found a rattle snake and was using a log to try to kill it. The animal slithered under the porch, hissing and rattling in fury. Inge chuckled and ran up on the porch, dancing to tease the snake into rattling and hissing some more. This is entertainment on the buffalo ranch. We sat down to breakfast on the side porch, a dozen hummingbirds buzzing over feeders above. Christian, Inge and her husband Tom cracked open cold beers. At 10:30 AM, it had already been a hard day’s work. They talked about the previous winter, and a blizzard so bad the snow had come up to the roof. Hundreds of cattle had died of starvation and thirst but the buffalo were smart enough to eat the snow and tough enough to dig through it to get to the vegetation below. They had survived. Somehow, I had a feeling this hearty bunch of Germans, who had already uprooted their lives once before, were going to do so themselves. Tune in here for random updates on exploits and explorations, as well as unpublished stories, musings, photos and various found objects. For now, I invite you to take a look around my new website, which was designed by Mary Wald and Doug Jones. Peter Ng created my logo. I will leave you with a picture of the Brooklyn Bridge, one of my favorite New York landmarks, to which I will reluctantly bid farewell when I depart in three weeks to start a new adventure. 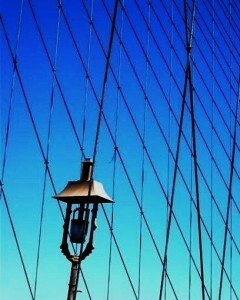 Copyright © 2004–2012 Yasmin Ghahremani. All rights reserved.